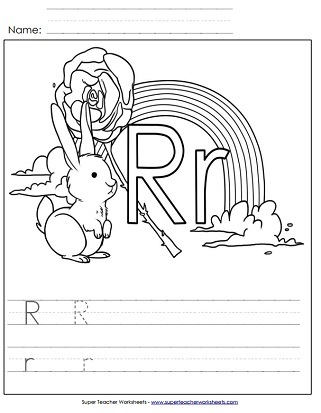 Practice writing R and r on the primary-ruled lines and then color in the pictures of the rabbit, rose, and rainbow. Color in the pictures of the rake, rooster, and rhino before assembling the headband to wear. 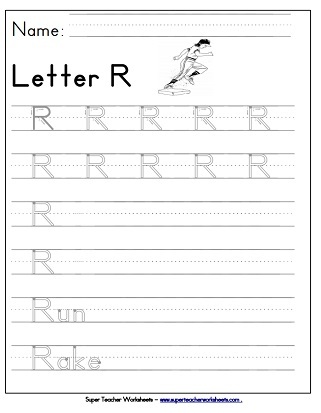 This is the perfect worksheet to learn to write lower-case r.
Print this worksheet to work on writing lower-case r.
Use your pencil to trace alone the dotted lines on this worksheet featuring capital letter R.
Trace along the gray lines to practice writing capital letter R.
Practice writing capital letter R and lower-case r with this printable. Letter R is easy to recognize when practicing with this worksheet. Use a bingo dabber to mark the circles.